The Heat Map shows you which traders or accounts are generating activity that has a high degree of similarity to regulatory cases. Each rectangle represents a group of clusters using color to indicate the level of risk, and size to indicate the number of clusters. These visual cues help you prioritize your cluster group review based on activity that generates the most risk. Heat Map: Displays the Heat Map view of the selected data as well as filtering and navigation tools. Data Selection Panel: Manages the dates available to TT Score and specifies the criteria to use when populating the list. 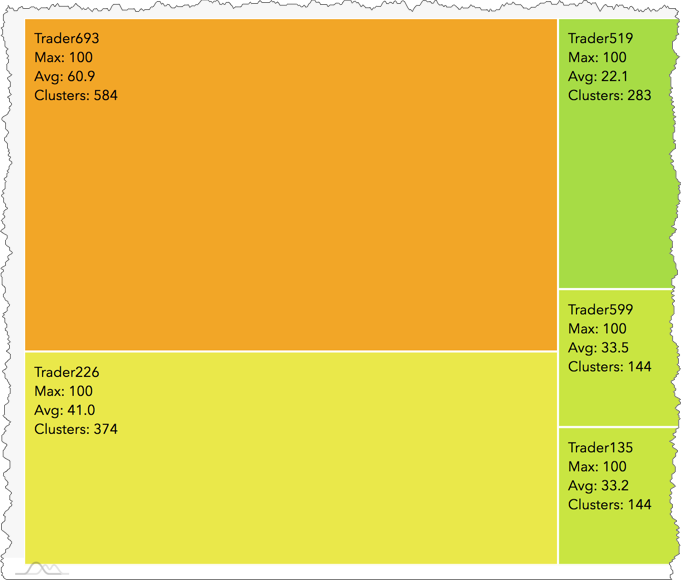 The Heat Map groups clusters by trader, instrument, or account, and displays these groups as a collection of blocks. 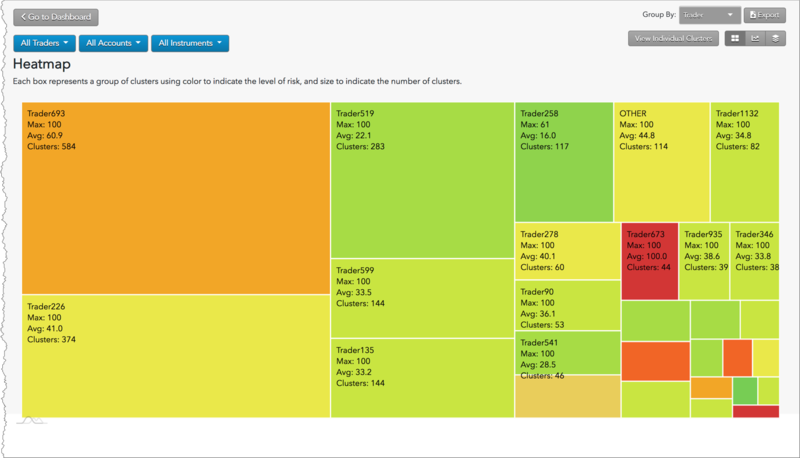 TT Score calculates a risk score for each block based on the clusters in the group represented by that block. The color of a block indicates the severity of the score. Low scores are represented as light green and high scores are represented as red. The size of a block indicates the number of clusters. Select View: Switch between Individual Clusters, Heat Map, Outlier Chart, and Daily Cluster Groups views. Group By: Sort the view by trader, account, and instrument. Cluster Filters: Filter the view by trader, account, and instrument. Export: Exports filtered data into a .csv spreadsheet file. On the left of the screen, the Data Selection Panel shows the daily activity logs that have been selected using the date picker and are available for data visualization. It also includes filters to apply to the data view. Score Range: Sets the maximum score of the clusters to include in each view. Date Range: Date-based selector to add daily activity data to analyze. Models: Sets which type of suspect pattern of trading to analyze in the data. Abusive Messaging: Quote stuffing schemes designed to introduce predictable latency into an exchange's quoting engine or malfunctioning algorithms that might cause market disruptions. Cross Trading: A cross trade occurs when a buy order and a sell order for the same instrument are entered for different accounts under the same management, such as a broker or portfolio manager. Momentum Ignition: Behaviors that indicate an attempt to create an artificial price movement with aggressive orders followed by an attempt to capitalize on such movement. Pinging: The entry of multiple small orders intended to discover hidden book depth followed by a series of order actions designed to force the large order to trade at less desirable prices. Spoofing: Patterns of manipulative or disruptive trading activity that involve the placement of a number of orders for which a trader has no intention of executing in an attempt to move the market. Wash Account: The same account ID is both the buyer and seller in the same transaction. Wash Trader: The same trader ID is both the buyer and seller in the same transaction. Apply Filters: Applies the selected dates and filters.